STEP 3: You can pick up a skirt anywhere. Like a DI or thrift shop. It won't matter what shade of yellow the skirt is because you're going to sew strips of fabric over it when you make the ruffles. The skirt should have an elastic waistband and no decorations of any kind anywhere on it. You might want to get a skirt made out of the same fabric as the fabric for the ruffles you're going to add on later. So a cotton blend or something around there. :) I wouldn't recommend using a super thick and heavy skirt because it will be hard to sew together later on. : / The skirt's shape should be loose fitting, not something like a pencil skirt, so that you can move freely. STEP 4: When you have your skirt, measure the length. This will determine how many ruffles you want to sew on. For example; if your skirt was 20 inches long you might want to have five 4 inch wide ruffles or ten 2 1/2 inch wide ruffles. PS when you're doing the ruffles you'll want to hem one side and leave the other side raw. The raw side will be hidden under the ruffle above it. STEP 6: Sew the first ruffle just below the elastic waistband and the last one on the hem of the skirt. There should be at least 1 inch of space between each ruffle like I said before. :) Make sure to try on the skirt every time you add another ruffle to see if there needs to be any adjustments. When you have sewed all of the ruffles on put on the skirt and adjust it wherever it's needed. :) Then you're done! 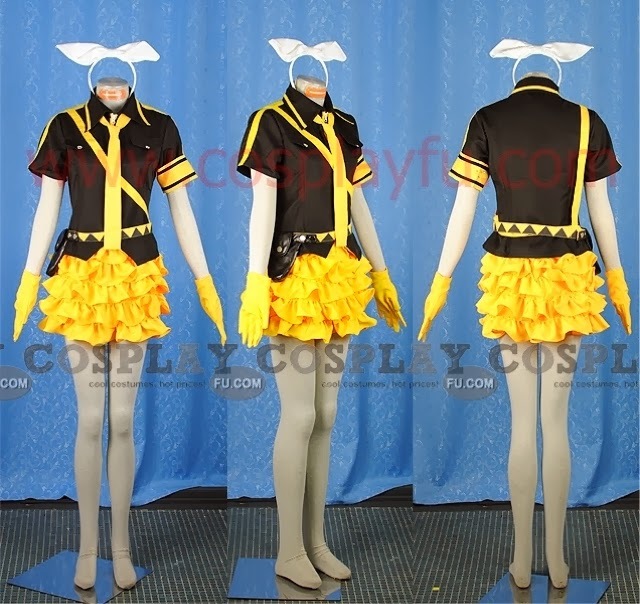 This is an awesome skirt that you can use for both cosplay and regular use. :) Either way it's a really cute skirt. :D Thanx for viewing this post I hope it helped you with your Love is War cosplay needs and please spread word of my blog! It would be awesome! XD I will try to get a video up soon for this tutorial and others. ^^; I know I keep promising that but this time I'll try to actually get them done and posted!